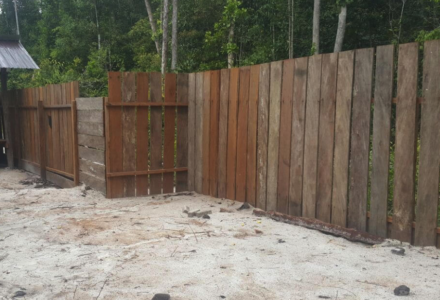 A new playground for the youngest orangutans at the rehabilitation centre Nyaru Menteng, Central Kalimantan, was opened in August of 2018. 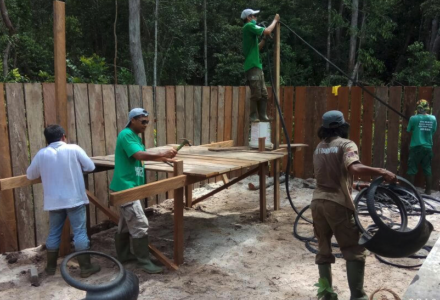 The playground is an extension to the Baby School, and it will be used on days when the orangutans cannot play in the forest, for one or the other reason. The initiative to the new playground was approved when Save the Orangutan visited Nyaru Menteng in the autumn of 2017 as a measure to improve the animal welfare at the centre. Before the new playground was opened, the youngest orangutans could play and acquire skills in a forest area close to the Baby School. However, sometimes the orangutans are too ill, or the weather too poor for the babysitters to bring them to the forest area. A fundraising campaign with the specific aim of building the new playground ensured that DKK 32,600 could be earmarked and sent directly to our Indonesian partner BOS Foundation, who was responsible for the construction of the new playground. The construction was initiated early in 2018, and in the beginning of August 2018 it was completed with grass and several enrichment tools. Thank you for your support to all of you who donated to this fundraising campaign. The playground could not have been constructed this quickly without your help. The playground has ramps, ropes, baskets, and tires, which inspire play and promote the development of climbing skills in the youngest orangutans.